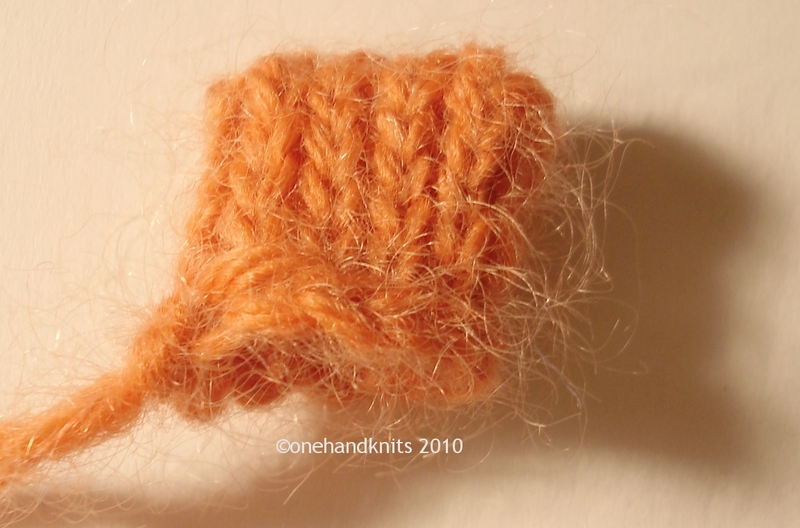 The Turkish Cast-On is an invisible cast on, similar in principle to the provisional cast-on (described in Casting-On 2), that forms a closed end/ pouch/ toe or the centre of a square/ rectangle depending on the choice and position of any increases made thereafter. 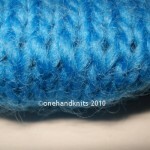 It is perfect for things like toe-up socks, mittens, glove fingers, purses and slipper/ bootee bases. 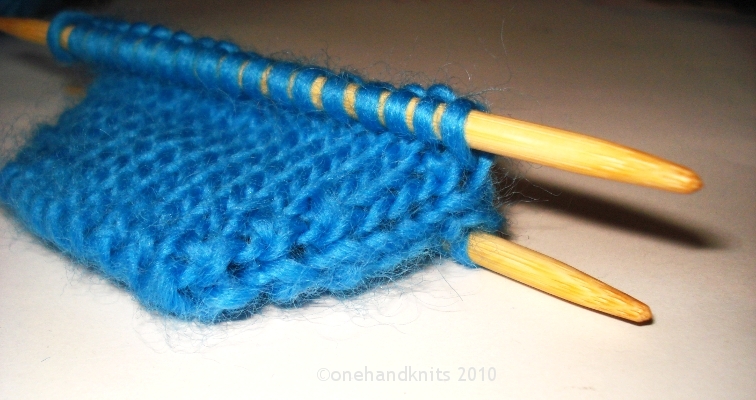 It uses two sets of circular needles of the same diameter (length is not important but longer than 50cm makes for easier working). 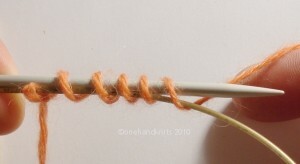 Knitter’s familiar with the magic loop technique can use one set of long needles. 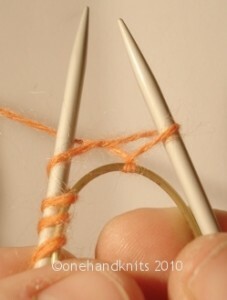 On needle A (in this case the bamboo) make a slip knot (SK). Hold needle B (metal for clarity) parallel above needle A with both points facing in the same direction and the working yarn held behind. 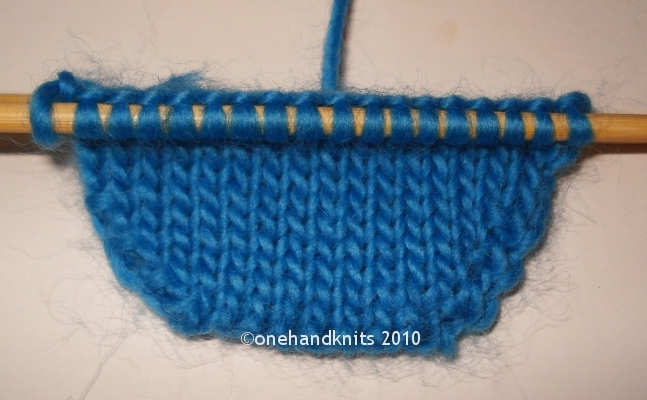 Working from left to right wrap the yarn loosely around both needles until you have half the desired number of cast-on stitches set by the pattern. 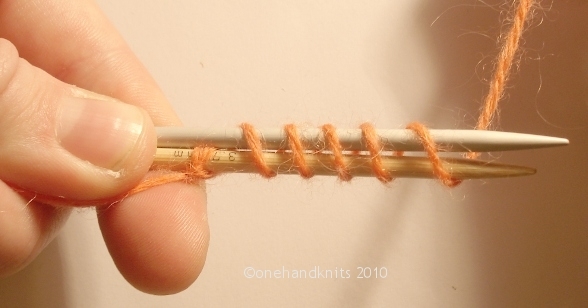 Pull the bottom needle through the stitches so that they sit on the cable. You can ignore this needle for now. 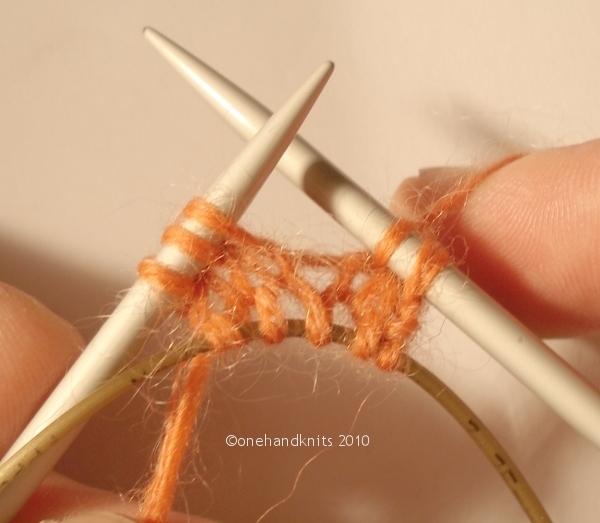 Bring the empty metal needle up to knit from the cast-on stitches on needle B. Once you have completed knitting all the stitches on needle B turn the work though 180 degrees so that needle A is now on top. Slide the unknit stitches from the cable onto needle A and the knit stitches back onto the cable of needle B. 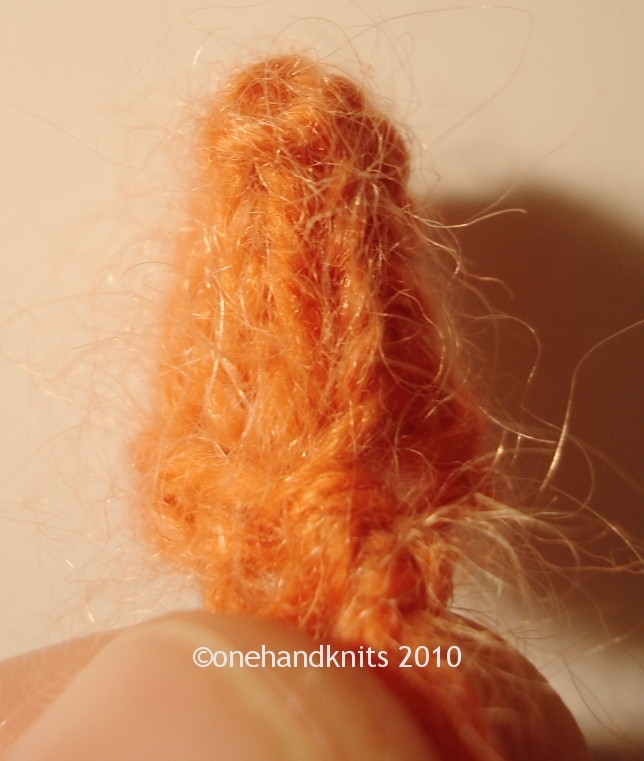 Slide SK off the needle and undo, allowing the waste yarn to hang free. 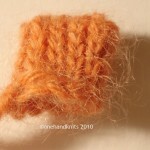 Bring the working yarn up from the last stitch on needle B and keep taught. 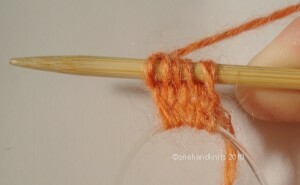 Using the empty bamboo needle, knit from the top set as before. This completes one round. 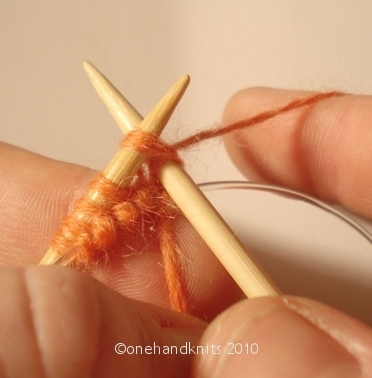 Pull needle A through, as before, so that the new stitches sit on the cable and the needles hangs free. 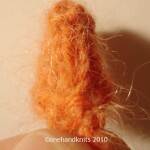 Turn through 180 degrees. 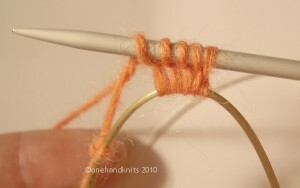 Slide the stiches from the second cable to the tip of needle B and begin round 2. 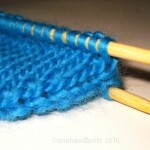 Repeat from step 6, alternating needles with each half row. 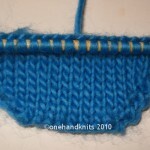 Without any increases a seamless rectangular pocket will form. For socks: increase in the first and last stitch on each needle causing the sides to spread diagonally (or in a gradual curve by putting a greater number of rows each time between the increase rows). 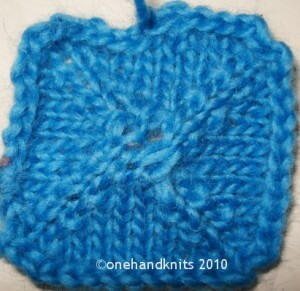 To make a rectangle/ square: Knit 1 row round. Increase in 1st st with DPN1. 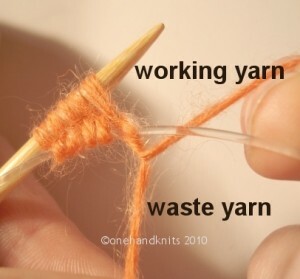 Change to DPN2, increase in 2nd st then K to within 2st of end of needle B and incr in the nxt st. Change to DPN3, increase in last st of needle B and 1st st of needle A. Change to DPN4, increase in nxt st then K to within 2st of end of needle A. Change to DPN5 and incr ease in last st – the change of round now sits in the middle of one side of the square/ rectangle (best marked with stitch marker). Subsequent increases are worked in the first and last st of every DPN i.e. 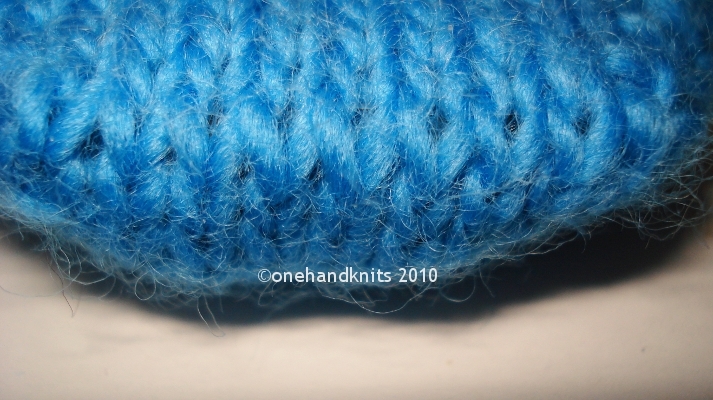 the ‘corner’ stitches. 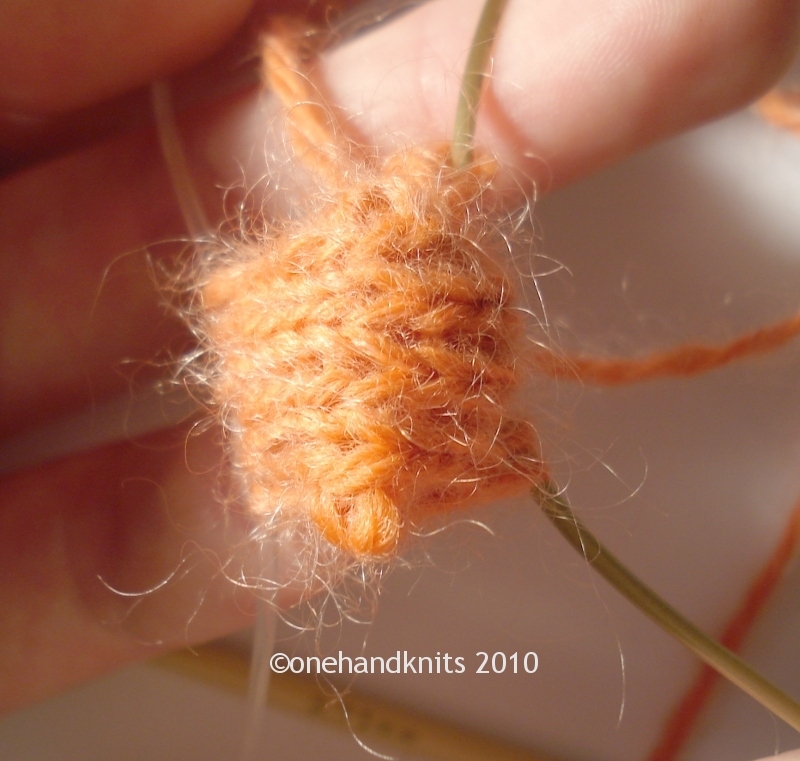 This entry was posted in Advanced, Knitting Tutorials and tagged advanced, bootee, cast on, circular needles, circulars, double pointed needles, DP, DPN, DPNs, DPs, finger, fingers, gloves, how to, instruction, instructor, intermediate, invisible, knit, knitting, learn, learning, mittens, pouch, provisional, purse, rectangle, socks, square, teach, teaching, toe up, turkish, tutor, tutorial. Bookmark the permalink.